The Basement Nerds Computing Job Tracker is a full-featured solution for computer and mobile repair shops. From check-in kiosks to automatic invoice generation and every step in between, this hosted software has everything you need to manage workloads, increase efficiency, and track all current and past jobs in your repair shop. Give yourself insight into your operations. With granular user administration, built in timeclock, and a plethora of statistics and graphs built in, you’ll know everything that goes on in your shop. Global search helps dig into jobs and numbers easily. A customer-friendly and streamlined check in process. Get the information you need for quick turn around. Generate barcode labels for all computers, devices, accessories, parts, and drives to keep seamless track of everything. Manage your employees in one system – from punching in with RFID badges to generating reports for payday. Make a new job easily without the kiosks, easily enabling mobile check in and on-site work. 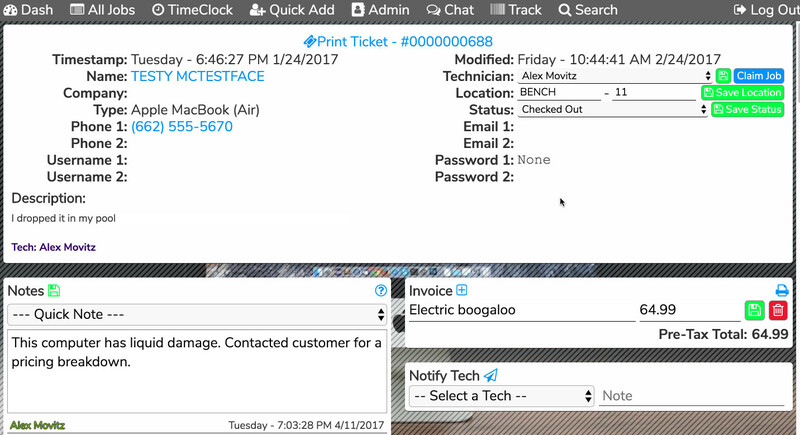 Automatic ticket generation – at a glance information to handle jobs. Keep track of jobs by technician – claim jobs and notify the correct tech. Keep track of a computer or device’s location in your shop. Never lose something in the clutter again. Give jobs a status, such as ‘Waiting for Pickup’ or ‘In Repair’ and let your clients know at a glance how the job is progressing. Keep historical notes, add links to parts or knowledge bases, and more! Logging information keeps techs informed and provides accountability. Automatically generate and print invoices, complete with historical invoices for jobs. No need for shouting back and forth, simply use the built in chat to talk between techs. Add your own inventory and pricing to make repeat jobs and discounts easier to generate ivoices. Finally, a solution to running a better repair shop.